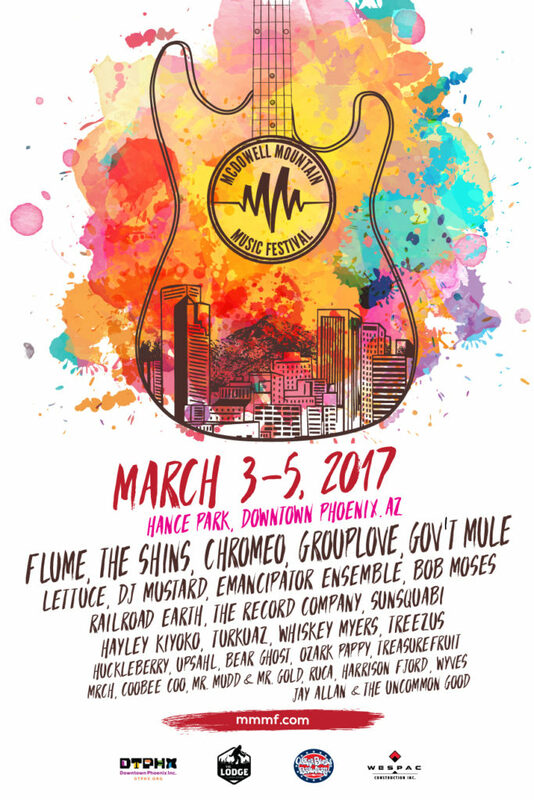 AZ’s 100 % nonprofit music festival announces eclectic lineup for the 14th annual celebration on March 3-5, 2017 at Hance Park in Downtown, Phoenix. Phoenix, Arizona – November 3, 2016 – McDowell Mountain Music Festival is ecstatic to announce the lineup for the 14th annual music Festival on March 3-5, 2017. 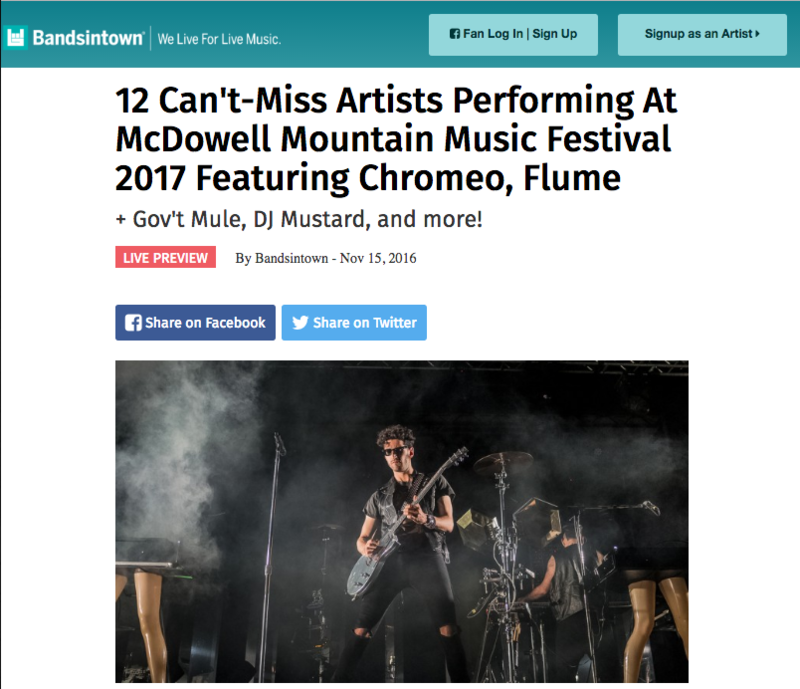 This year M3F brings top headliners to the Arizona music scene such as Flume, The Shins, Chromeo, and Grouplove. The lineup features numerous national artists such as Gov’t Mule, Turkuaz, and Bob Moses. 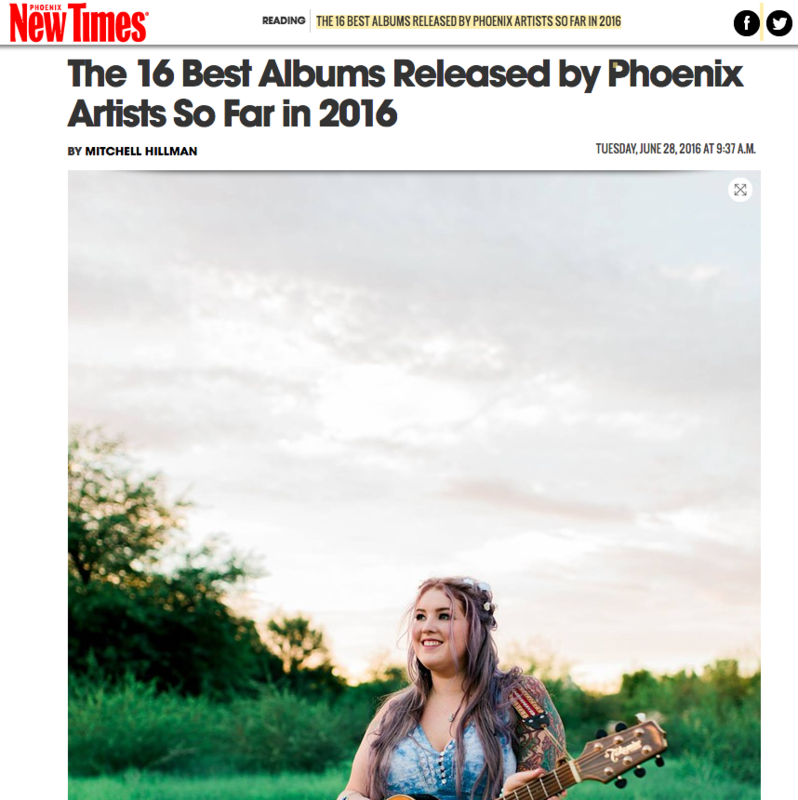 As a grassroots, Arizona-based festival, M3F doesn’t forget the local talent like Bear Ghost, CooBee Coo and RUCA. Along with the music, charity is part of the DNA that fuels M3F. 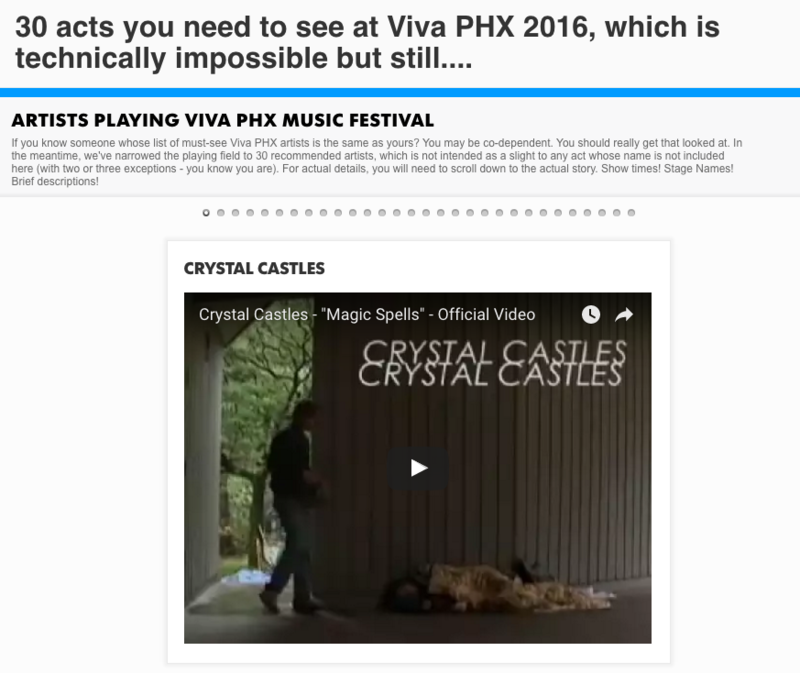 From its inception, the Festival has donated over $1,000,000 for local Arizona charities. In the most recent years, M3F has teamed up with two local, family-based nonprofits: Phoenix Children’s Hospital Foundation and UMOM New Day Center. If you are a fan of great local music and you haven’t heard Bear Ghost’s full-length debut album, Blasterpiece, I’m going to assume that you’ve spent the first half of this year in a cave. 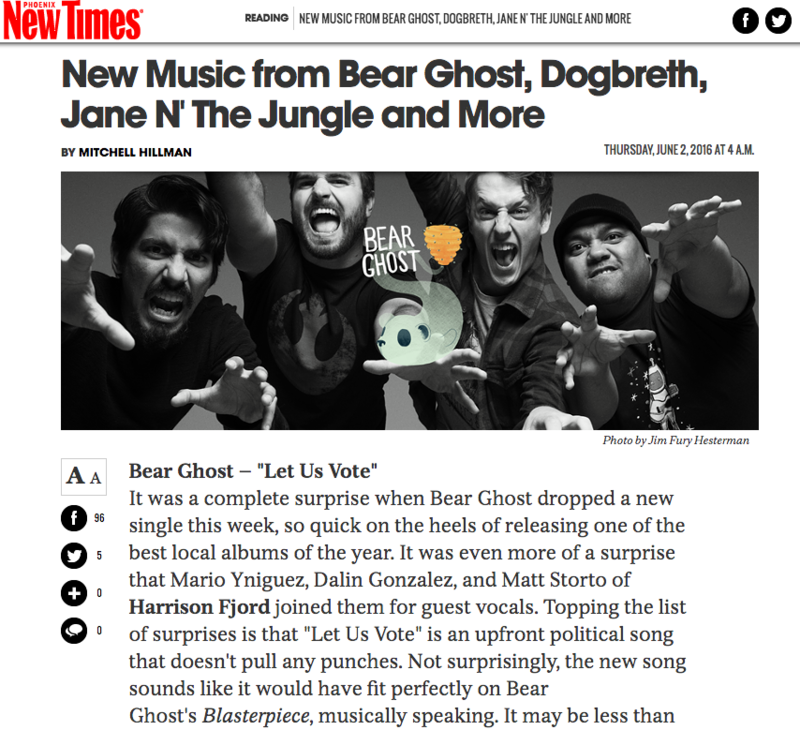 First of all, Bear Ghost is probably the most fun band in town to see live or listen to on record. “Fun” is an element that seems to be lost on a lot of indie bands, and it’s damned refreshing to be excited about going to see a band for the sheer sense of joy they will impart in their performance. Luckily, for Bear Ghost, they were able to translate the fun factor into every moment of Blasterpiece, and it’s a lot like their stage show come to life. I feel like I should always keep a spare copy of this album around for those occasions when someone tells me they’ve never heard of them. Their blend of pop, rock, prog rock, punk and even hip-hop defies the senses, and the assimilation of these styles creates something wholly unique that is all their own. It was a complete surprise when Bear Ghost dropped a new single this week, so quick on the heels of releasing one of the best local albums of the year. It was even more of a surprise that Mario Yniguez, Dalin Gonzalez, and Matt Storto of Harrison Fjord joined them for guest vocals. Topping the list of surprises is that “Let Us Vote” is an upfront political song that doesn’t pull any punches. Not surprisingly, the new song sounds like it would have fit perfectly on Bear Ghost’s Blasterpiece, musically speaking. It may be less than two minutes long, but it packs a hell of a punch, with a healthy dose of wry commentary on the current political atmosphere. This song takes place in the mind of the political villain, and it’s an interesting vantage to choose for a song. If you weren’t paying attention, this would just be another rousing, danceable indie rock song, but if you want to get inside the song, just check out the lyrics on their Bandcamp page. It explains the tune, and one read of the lyrics will illuminate the impetus behind the song as our villain thinks, “I will leave you ruined. … I’m inevitable / I’ll shove it through your news and lie lie lie.” In short, pay attention, not just to this song, but generally speaking as well. Depending on the outcome of this year’s election, Bear Ghost’s next album could well be full of rallying cries and political anthems. They could even get a concept album out of that.